When purchasing the filet, ask the butcher to cut it to your specifications. Look at the meat first. Ask for cut to come from the thickest end. Ideally, get a single piece that you can then cut into the ideal sizes when you get home. And, ask the butcher to trim off any excess fat. 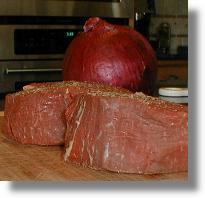 Typical cuts of filet will range from 6 to 12 ounces. For our recipe, we will prepare generous 10 oz. pieces for four guest. Take the meat out of cold storage and let it rest at room temperature one hour before you begin cooking. Cut into four equal 10 oz. pieces. Coat generously with fresh ground pepper and a touch of salt (optional). Be sure to get both sides! Add a bit of olive oil to your pan and bring it up to high heat. Sear the filet on both sides over high heat for about five minutes total (about 3 minutes on the first side, 2 on the second). Remove and place in a glass baking dish. Tuck into the oven to slow cook for 6-12 minutes; 6 minutes for rare, 8-10 for medium rare, 12 for medium to well. Remember, these are large, thick cuts, so a typical medium rare cut of filet will be very pink in the middle, which is perfect for my own personal taste! When the filet us done, remove from the pan immediately. Hint: If you are unsure how well done the meat is, cut a slit downward in the very center. Gently pull it apart so you can see. Later, when you serve, simply flip it upside down…no one will know the difference. Watch carefully, and be very careful not to overcook! When serving, as an idea for great presentation, consider cutting a wedge in each filet about 1/4 the size of the steak. Place the wedge on its side on the very top of the steak. When serving the plates to the table, be sure the open wedge portion faces the guest. Finish with a half-dozen long chives draped over the tall stack of filet. Or, just tuck in a couple of fresh basil or mint leaves so they stick out between the two pieces of meat. Serve on warm plates with a side of traditional potato and vegetable. I would recommend sides of asparagus coated with melted butter and homemade roasted garlic basil mashed potatoes. Fresh, warm bread will also accompany nicely. For wine, pair the dish with a full bodied Cabernet Sauvignon or traditional Bordeaux-style red. If you have been saving a dusty bottle for a special occasion, this would be the perfect opportunity to bring it out of your cellar. For the intricate art of wine pairing, this is a match made in heaven. Thank you for the wonderful recipe. Very straightforward and easy to follow. You’ve made one family’s holidays! Thanks again!